Welcome to our Luxury Apartment here in Brooklyn NY! 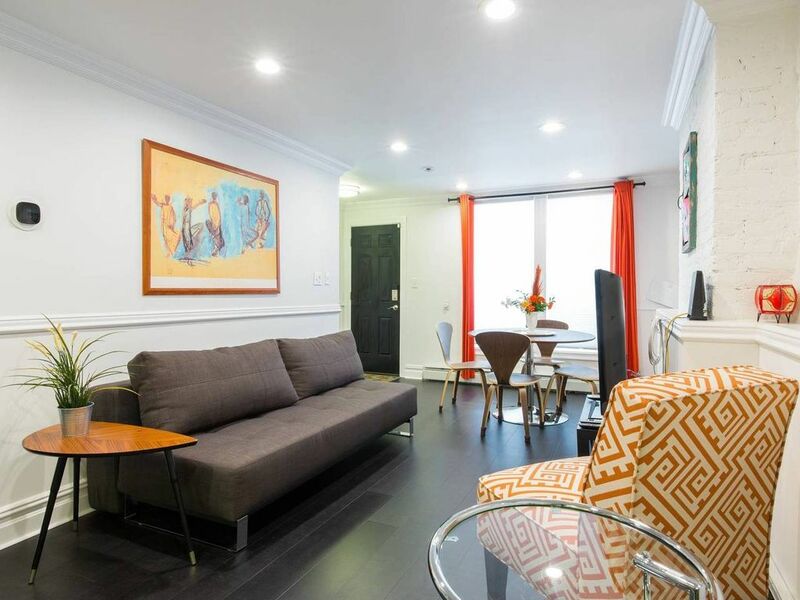 Our place is perfect for vacation or business travel and only 2 blocks from the express and local A/C trains putting us about 20 minutes to downtown Manhattan connecting you to some of NYC's most iconic attractions such as Central Park, the 9/11 Memorial, MSG and Time Square to name a few. We're also close to many local Bed-Stuy eateries, shops and attractions here in Brooklyn some of which include The Barclay Center, Brooklyn Bridge and much more! We have a beautiful, professionally designed, large one bedroom apartment in our newly renovated 2 family townhouse that sleeps 5 comfortably. The space is comprised of a large well decorated bedroom with an optional air mattress for larger parties, an impressively chic living room with a sofa bed and a flat screen tv for your entertainment needs and a fully stocked kitchen with a stove, dishwasher, microwave, toaster, coffeemaker, refrigerator, cutlery, dishes and utensils ... everything you need to prepare meals or store take out. The apartment also has free WiFi and a large desk so you can buckle down and work if needed. Keyless entry makes for easy access! Traveling with small children? no problem! Our apartment is perfect for a family. We can provide a pack and play with fitted mattress, crib sheets etc. Just let us know and we'll have it ready for you. Absolutely no smoking or pets are allowed during your stay inside and outside the apartment (i.e. front stoop or backyard). Failure to respect our house rules may result in you being asked to leave our home. A lot of care has been taken to ensure all amenities meet expectations so we kindly ask to please be considerate when using all appliances/facilities. Any additional overnight guests must be booked during your initial reservation otherwise they are not permitted during your stay. Absolutely no filming, parties or additional guests (unless paired with your initial booking)- If this is breached it will result in eviction. We kindly ask that loud music or conversations are not extended beyond 11pm weekdays and 1am weekends. If utilizing the backyard we kindly ask that any food preparation be done inside the apartment. Trash is not permitted. No parking on property - Street parking available 24/7. NYC alternate side parking rules will apply Monday-Friday but suspended on the weekends and some holidays. As a HomeAway host I like for our guests to view the world as I do, unscripted, fun with a convenient and comfortable space to come back to reflect on the adventures experienced each day! In my own travels I find myself quickly dismissing some of the standard tourist must sees and instead making room for experiencing travel through the eyes of those who call my vacation choice their home. Many come to NYC to see the sights that we are most known for, but I hope for our guests to experience Brooklyn as I do. Everyday is an adventure for my family and I, whether big or small, around the corner or a train ride away. This city is bursting with flavor and excitement waiting for those who are ready to explore inside and outside the box! Travel I believe is one of life's best lessons. It reminds us how vast, yet intimate our world is. Every country, city and town has its own unique flavor, but many commonalities as well. My favorite travel destination by far is the Caribbean! USVI, BVI, Aruba, Barbados, St. Martin, Trinidad & Tobago, the opportunities are endless. Each island shares many similarities while distinctly offering there own flavor making each visit unique. At home as well as abroad I think the things I value most are connecting with people, great food, a great book and the arts visual and performing arts. I look forward to connecting with my guests who choose the city I call home for their next vacation destination! Street parking available 24/7. NYC alternate side parking rules will apply Monday-Friday but suspended on the weekends and some holidays. Clean, beautifully decorated, very comfortable accomodations and easy access to public transportation. Kevin greeted us upon our arrival and helped us with the door lock. He was very friendly and welcoming. The place was surprisingly quiet for an urban setting and we had no trouble sleeping at night. It was our first visit to NYC and we were out late each evening sightseeing in Manhattan. We were a little nervous about walking in the dark from the subway station, but we were perfectly safe. No one from the neighborhood gave us any trouble at all. We had a wonderful time and would stay at this location again.